The museum will hold a ceremony Friday to mark the opening of the newly christened State Street Corporation fenway Entrance. Boston-based State Street donated $10 million toward reopening the Fenway Entrance. Also, the museum is going to be offering free admission on Sunday 6/22 through their Fenway entrance. So if you're planning on going - be sure to go thru that specific entrance. 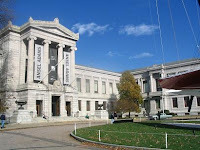 The MFA said there will be free admission June 22 for those who walk through the State Street Corporation Fenway Entrance. Entry to "El Greco to Velázquez," tours, family activities, and gallery talks will also be free. The day is sponsored by State Street Corp.
Free admission to the special El Greco exhibit is totally worth it. See you there. 0 Response to "MFA Entrance Unveiling & Free Admission"